WeTix, which is accessible through the WeChat Pay MY e-wallet that is now enabled for all Malaysian WeChat users. WeTix, a local cinema aggregator startup has announced a strategic partnership with Golden Screen Cinemas, MBO Cinemas and mmCineplexes to provide moviegoers with a platform to purchase movie tickets directly within the WeChat Pay MY e-wallet. WeTix, which is accessible through the WeChat Pay MY e-wallet that is now enabled for all Malaysian WeChat users, aims to further assist and empower cinema operators to establish a closer relationship with consumers online, as well as in reducing offline operating costs. Moviegoers can enjoy a simplified movie-going experience - from making real-time comparisons between their preferred movies at the cinema of their choice at a glance, selecting the date, time and seats, to completing their purchase with ease using the WeChat Pay MY e-wallet. This gives customers a seamless cinema and movie-going experience. According to Lim Kar Aik, founder of WeTix Malaysia and APAC Venture Sdn Bhd, WeChat's Preferred Partner in Malaysia, he was inspired to create the platform after years of personal experience with the traditional way of purchasing movie tickets. "Have you ever tried to book movie tickets at the cinema only to find that at the last minute all of them have sold out? Or having to switch between apps or websites when you cannot find a desired time slot? I remember the frustration and this fueled me to create a platform where everything is available in one place. I want to make browsing for cinema showtimes and purchasing movie tickets so much more convenient for people and to make their movie-going experience more rewarding." The event was attended by Jason Siew, Chief Executive Officer of WeChat Pay MY; Lionel Loh Keong Chung, Senior Marketing Manager of Golden Screen Cinemas; Syed Hariz, Digital Media Assistant Manager of MBO Cinemas; and Jason Teo, Marketing and Business Development Director of mmCineplexes. Several major movie distributors in Malaysia were also present at the press conference and launch event. In conjunction with the launch of WeTix today, WeChat Pay MY will be running a promotional campaign for movie ticket purchases made within its e-wallet via WeTix. From 10 October 2018 to 24 October 2018, WeChat Pay MY users who spend a minimum of RM30 on movie tickets and snacks will receive an instant discount of RM10*. Wanna stay in touch with families and friends? WeChat Pay MY users can also get RM3 off* upon every mobile top-up of RM10 through WeChat Pay MY. "Following our successful launch of WeChat Pay MY in summer, we are excited to introduce the new entertainment category to users of WeChat Pay MY, which enables them to enjoy mobile payment even more and to further integrate it to their daily lives," said Jason Siew. 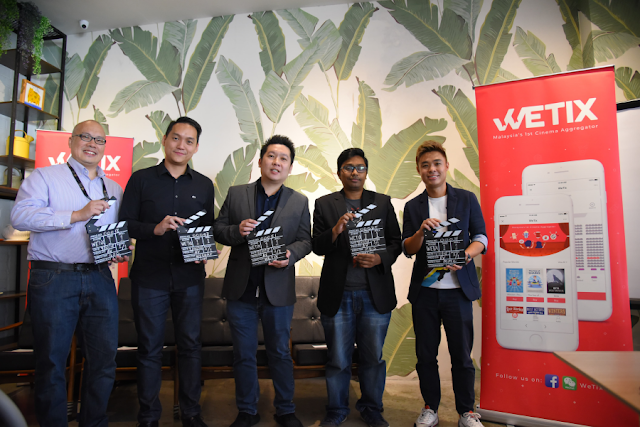 "While we are pleased to announce with WeTix that WeChat Pay MY is now available at Golden Screen Cinemas and MBO Cinemas, both of which are among the biggest movie chains in Malaysia, we also look forward to partnering with more local merchants of all sizes in delivering a simple, secure and convenient mobile payment experience in a range of online and offline payment scenarios to users in Malaysia." WeChat's robust ecosystem allows WeTix to provide a rewarding online to offline (O2O) experience for movie lovers; WeTix followers are able to receive the latest movie news from its WeChat Official Account and purchase movie tickets for the next blockbuster hit from the WeTix platform. WeTix also actively hosts a variety of movie ticket and merchandise contests as well as giveaways in partnership with cinema operators and movie distributors in Malaysia to reward customers and to promote new and exciting movies. For now, consumers will be able to view movie listings and purchase movie tickets from Golden Screen Cinemas and MBO Cinemas, with mmCineplexes scheduled to go live on WeTix soon. WeTix is also currently speaking to other major cinema operators to get them on board in the near future.